Hoover are a long-standing household name and for good reason. For over a century they've been creating and innovating to make day-to-day life easier, so you can spend more time doing the things you love. 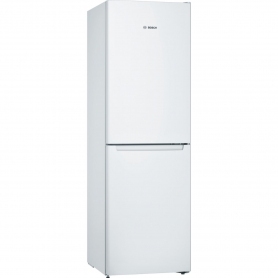 Whilst renowned for their vacuum cleaners, the HSC536W is an exceptionally well-priced fridge freezer. Finished in a bright, clean white and with a modest combined net capacity of 173 litres it's perfect for compact living, providing an array of storage built to effortlessly accommodate all aspects of a weekly shop. 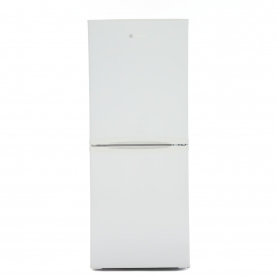 This fridge freezer is a great pared-down option, offering simple, straightforward refrigeration with an extremely affordable price tag. A 50/50 split ensures there's plentiful space for the smaller family while a variety of internal design features help to keep your food well-preserved and accessible. The fridge cavity consists of 2 adjustable safety glass shelves, 2 door balconies (1 of which provides extra deep storage for large bottles) and a roomy salad bin to keep your fruit and veg fresher for much longer. An internal lightilluminates right to the back of the shelves to further aid in making the most of your money - so opened food isn't forgotten and left to spoil - and with a user-friendly temperature dial allowing for a tailored cooling environment, you can stay happy and healthy with next to no waste. 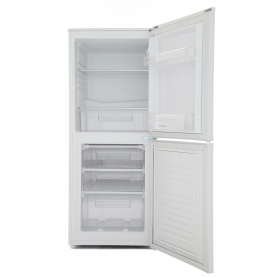 The freezer space incorporates 3 spacious drawers, suitable for anything from boxed-up leftovers to the Sunday roast. Alongside all these storage features, Hoover has ensured that your convenience is second only to the HSC536W's chilling capabilities. Take stock at a glance with clever clear containers while auto defrost saves you one more job (and a substantial amount of time). Reversible doors make installation uncomplicated and with adjustable feet in place to keep the appliance sturdy, you can put it just about anywhere you like. The fuss-free integrated handles make accessing the interior easy even for those a little less able and with an eco- and pocket-friendly A+ energy rating to boot, this inexpensive contribution from Hoover is an ideal budget buy.